Erasmus+ has a long history in reinforcing the acquisition of knowledge, skills, and competencies through the facilitation of the mobility projects. The basic aim of the project is to support the professional development of those who work in education, training, and youth with a view to innovating and improving the quality of teaching, training and youth work. In this framework, the Islamic University has involved in the mobility scheme and there has been a number of participants who got scholarships abroad all year along. The Dean of Community Services & Continuing Education-CSCE- Prof. ٍSaid El-Ghorra was at the University of Humboldt meeting with the Director of the International Relations Office at Humboldt University Dr. Matthias Barsk and the President of the Institute of Rehabilitation Sciences Prof. Claudia Baker. In addition to Dr. Hazem Shehadeh, IUG Director of the Disability Services Center in the CSCE Deanship, who is contributing in a period of research at the University of Humboldt since the beginning of the first semester. In addition to visiting the Humboldt International Relations Office where Prof. El-Ghorra was introduced to the deaf education services and the pre-university deaf education programs offered at Humboldt, IUG Professor also visited three educational fields that care about deaf students. IUG Dean was given detailed information, by Prof. Claudia Baker, about the Institute of Rehabilitation Sciences and services and the programmes beside projects that the Institute is carrying out or overseeing. As one of the mobility project's aims is to exchange experiences and acquire competencies, Prof. El-Ghorra visited the class of teaching the sign language in the institution, having a closer look at the deaf students and knowing their inclinations and motivations for joining the program. Meeting deaf students was inspirational to have IUG students online and discussing with them the services which offered to students with hearing impairment at IUG center. Plus, a Basic School for Deaf in Berlin was paid a visit by our professor. And he got to know that this school basedcompletely on using a full German sign language in the teaching process. Discussions on the mechanism of teaching deaf students and the methods used in the educational process took a wide space and surpassed the visit's horizon to include more discussions about the development of the IUG deaf center. Furthermore, the two universities agreed on growing joint cooperation that could lead the expansion of the IUG current program to include teachers of the basic stages in Deaf schools in the Gaza Strip. 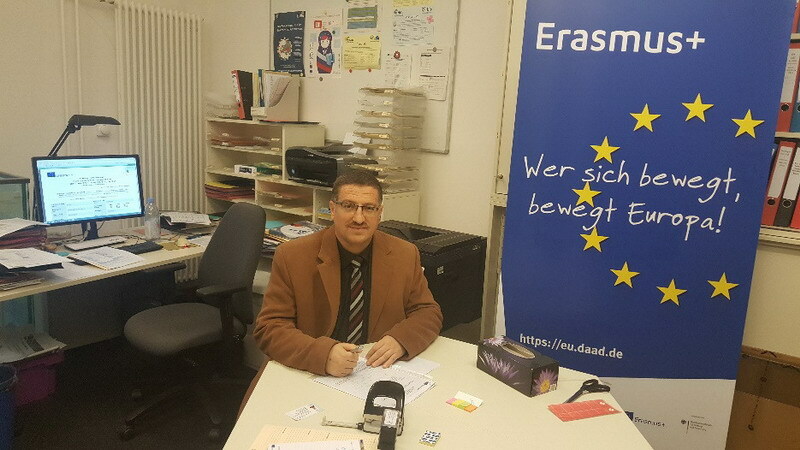 Prof. El-Ghorra scheduled his trip to visit the Faculty of Medicine at Humboldt University where he got to know about the teaching mechanism of anatomy and the design of autopsy labs. In addition, he was accompanied to the experimental- animals' lab, where he did realize how these animals were raised, cared of and tested for experiments. 1- Application for joint projects between the two universities. 2- Arrangement a visit of Humboldt team to the Islamic University in the coming months. 3- Possibility of expanding the current international exchange program between the two universities. 4- Discussion of a series of programs and projects that of a joint interest of the two universities, the Humboldt University & Islamic University.